I have had this recipe for a lovely light fruit loaf for a long time and have often made it for gifts. It's not as tricky as normal Christmas Cake to make, so it was easier to adapt, and I think the end result should please even my most picky eaters ...... especially after a month or so of soaking in brandy! Even if you are not British, you might find you actually enjoy this cake. 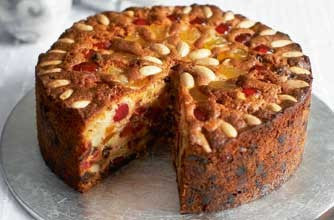 It's full of fruits and nuts, rich with eggs and butter - and marinated in brandy .... what's not to like! 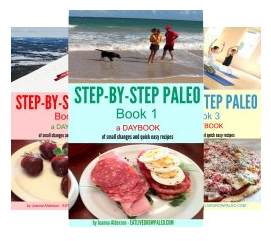 - 1 1/2 cups of chopped mixed dried fruits (Any combination. 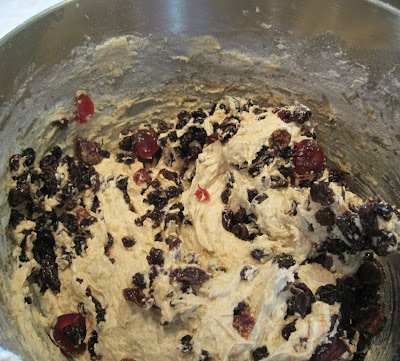 I use raisins, currants, chopped apricots, some candied citrus peel, and red and green glace cherries cut in half) Yes, these do contain a lot of sugar but this cake is only eaten once a year. - Soak the dried fruits in enough boiling water to cover for 10 minutes, then drain well. - Prepare a square or round 8 inch cake pan by greasing the sides, then lining the bottom and sides with parchment paper. If you have a pan with a removable bottom like you use for cheesecake, this is the best kind to use. - Sift the almond flour, coconut flour, baking powder and salt into a mixing bowl. - Add the coconut sugar and the zest and mix well. - Using a pastry blender, cut in the butter until the mixture resembles the consistency of fine bread crumbs. - Stir in the dried fruits until evenly distributed. - Whip the eggs with the cream and almond extract, then add to the mixing bowl and mix thoroughly. The batter will be very stiff. - Cool for 20 minutes, then remove from the pan and cool completely on a baking rack. Put about 2 tablespoons of brandy into a small bowl. Take a toothpick and poke holes evenly over the top of the cake. 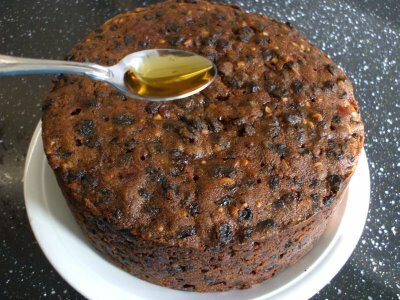 With a teaspoon, slowly pour a little brandy over each hole so it soaks into the cake. Once you have done this, the next thing is to wrap it in wax paper and store it in a tin. (An old cookie tin is perfect for this.) If you don't have a tin, just wrap it again in an old kitchen cloth, put it into a Ziplock bag, then store it in your fridge. Normal Christmas Cake will keep on a pantry shelf for up to a year, but I'm not sure with this one, so to be safe I'd keep it in the fridge. 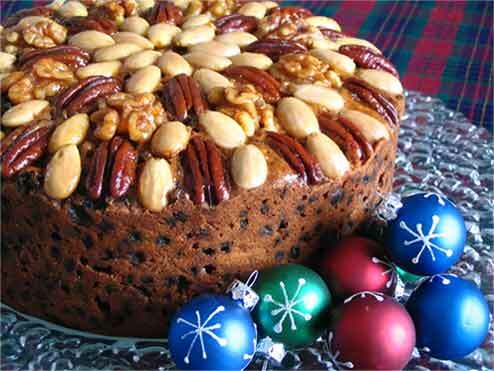 The trick to a fabulous Christmas Cake is to make it a few weeks before Christmas, and then to "feed" it again with brandy every week. (Just a couple of spoonfulls at a time is enough.) By the time the holidays roll around it will be absolutely perfect. Christmas Cake is traditionally served with a layer of marzipan and icing, but I think now that we know the dangers of too much sugar, that would be taking it a bit too far. I prefer to top my cake this year with a glazed nut topping instead. It looks just as festive but is much better for you. If you want a bit more colour, you can also use candied fruit, and an even easier option is to decorate it before baking with almonds as shown above. You can then just glaze the top. To make this topping, you need a variety of nuts (I use walnut halves, pecan halves and Brazil Nuts), some sugar-free apricot jam, and some more brandy. In a small saucepan melt 2 tablespoons of the jam with 2 tablespoons of brandy to make a glaze. Using a pastry brush, spread one third of this over your cake top so it covers it completely. Arrange your nuts in whatever pattern you desire, then brush them with the remaining glaze until all the nuts are covered as well. Once the glaze has cooled, store in a covered container in your fridge for up to 2 weeks. This looks delicious, but the alcohol doesn't cook out right? Thanks! Oops. Cake is in the oven but my chopped nuts are still sitting in the food processor. I'm guessing I should have mixed them in when it says to mix the fruit in? They're not to just go on top are they? Hi! Thanks for your recipe. I had to make adjustments- this time of year we are out of coconut flour but still pretty flush with pattypan flour (which I make myself.) As our season usually goes, we haven't started making coconut flour as we make our coconut milk, because the goats are still in milk. For the fruits and nuts, I use plain dried fruit - usually more than half what we harvested or bartered for, the rest this year were bottom of the pantry raisins that were too dried for anything but brandying. So, in two wide mouth half gallon jars, back in early November I put in each jar 2 cups walnuts, 1 cup pecans, 2 cups raisins, a handful dried peach halves, the same of plums, a cup of dried apple, fig pieces, and the last of the candied orange and lemon peel we made last winter. Oh and a sprinkling of whole coffee beans. One cup of brandy, seal, then rotate the jars daily until December 1 then drain, mince or pulse in a food processor. I added some boiling water but not as much as your recipe calls for, because the fruits are already pretty moist. Doubling the recipe plus all that fruit fills two 9x12 pans, which are baking now! They will be drizzled with the soaking brandy I drained off, then when cold each pan cut into 8 mini loaves, wrapped in parchment and "fed" regularly until Solstice when they are wrapped for gifting.